A puppy whose constant barking saved a woman's life is to be honoured. Springer spaniel Ghillie was just nine months old when his owner's mother, Mary Wilson, collapsed while they were out for a walk near Kirkwall, Orkney. His barking attracted the attention of nearby workers and an unconscious Mrs Wilson was taken for treatment which saved her life. Ghillie is to receive the PDSA gold medal for gallantry and life-saving devotion later this month. 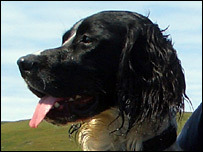 The incident happened on 19 December, 2005, when Mrs Wilson, from Fair Isle, was staying with Ghillie's owner - her son Alan Wilson, a Kirkwall vet. The barking of Ghillie was heard by a group of Hydro workers who were inspecting poles nearby. The dog's persistence led them to follow him back along the path to the spot where Mrs Wilson was lying unconscious. The location was difficult to access, so she was carried in a tractor to an ambulance which took her to Balfour Hospital, where she spent the night. She made a complete recovery, but it is thought that without Ghillie's determination the outcome could have been very different. Marilyn Rydström, director general of PDSA, said: "It is an honour to announce the award of the PDSA gold medal to Ghillie, an exceptional dog, who was only nine months old at the time. "His devotion and persistence that fateful December day undoubtedly saved Mary's life. "This is an extraordinary story of that unique and inexplicable bond between people and pets." Ghillie will be presented with his PDSA gold medal on 20 December.